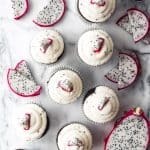 Slightly floral and lightly citrusy, with beautiful specks of black seeds, this Dragon Fruit Buttercream Frosting pairs perfectly with my favorite moist chocolate cupcakes recipe to make an interesting, tasty dessert. Blend the dragonfruit in a blender or food processor until smooth. Set aside. Beat the butter in a stand mixer with the whisk attachment for 3 minutes until light and fluffy. Add the powdered sugar, dragon fruit puree, vanilla, and pinch of salt and mix together on low speed to combine. Continue to add the remaining powdered sugar to get a nice, smooth buttercream. Transfer the frosting to a piping bag and use to decorate cupcakes. Garnish with extra bits of sliced dragon fruit. Recipe inspired by The Little Blog of Vegan.